The pink Railed board was mine. That is my buddy George Quigley. His little brother Ronnie was on the NSSA team with Curren and just about as good a surfer. He also came up with some of the early art for Hurley with Billibong before he passed away. I took that shot with an old Kodak underwater camera. Wow! Thanks for the info Noel and thanks for allowing us to share the pic. No biggie on the picture. I enjoy the pictures and information on your site. All the McCoy eye candy is nice. 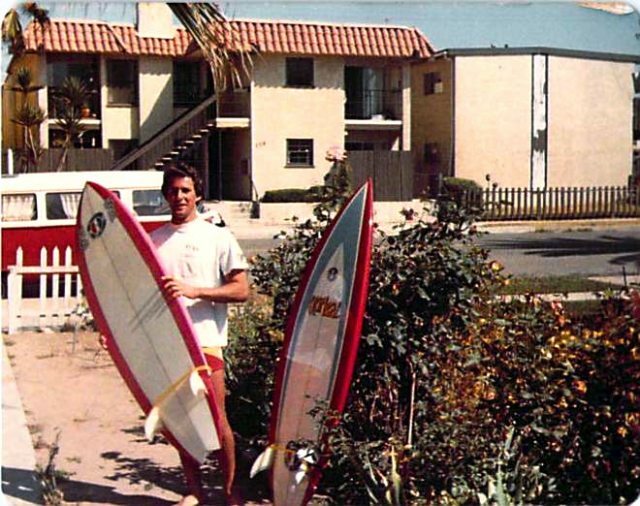 That pink board started the ball rolling towards the modern surfboard. About time to see Geoff finally getting some credit for it. I will get you some more shots of Ronnie from George. He has the picture of the NSSA team with his brother Ronnie. You should see the Zulu Surf club line of shirts he did. I remember when Hurley brought that first Billibong stuff around also. A fun summer. We all liked the Echo beach Quik stuff though. Checked board shorts and spiked hair. Long time ago.